The Tribe of Joseph in America is the Native Americans. The Zion of the last days is America. The following is an article from the official church journal The Evening and Morning Star, November 1832. Following that is an article from the official church journal Zion’s Reveille, Sep. 2, 1847. HAVING given a sketch of the history of the ten tribes, in our last, the next subject which presents itself, is the tribe of Joseph. The Lord was with Joseph in his youth and not only his dreams, one of which says, that the sun and moon, and the eleven stars made obeisance to him, but much of his life was a type of future events in relation to his seed. His being sold unto the Egyptians, was a wise plan of the Lord to show his power to Israel, and to convince the world, that he is merciful to such as keep his commandments, and seek the path of endless virtue; yea, all the workmanship of his hands. The history of Joseph, in full, cannot at present be given; but in part, it will occupy a great place in the hearts of such as seek diligently the kingdom of God and the welfare of scattered Israel. It is so well known that Joseph was the beloved of his father, that we can quote the words of the good old man pronounced upon him, as what should befall him, or come to pass among his seed, in the last days, without the fear of contradiction, and with a great deal of pleasure, as well as satisfaction, knowing that the very days have arrived for the fulfilment of that prophecy: [Gen. 49:22-26] Joseph is a fruitful bough, a fruitful bough by a well, whose branches run over the wall: The archers have sorely grieved him, and shot at him, and hated him: But his bow abode in strength, & the arms of his hands were made strong by the hands of the mighty God of Jacob: (from thence is the Shepherd the Stone of Israel:) Even by the God of thy father, who shall help thee, and by the Almighty, who shall bless thee with blessings of heaven above, blessings of the deep that lieth under, blessings of the breast and of the womb: The blessings of thy father have prevailed above the blessings of my progenitors unto the utmost bound of the everlasting hills; they shall be on the head of Joseph, and on the crown of the head of him that was separate from his brethren. This is one of the greatest prophecies in the bible, and contains more of the economy of the Lord than will be seen till the Redeemer comes to dwell on the earth. What an admirable expression is that; the branches run over the wall; as plain as to have said, some of his seed shall cross the ocean. But the most profound is, From thence is the Shepherd, the Stone of Israel. It could not mean the birth of the Savior, for Paul says it is evident our Lord sprang from the tribe of Judah: But when Paul said to the Romans, [Rom. 11:26] There shall come out of Sion the Deliverer, and turn away ungodliness from Jacob, he must have meant the Deliverer, which is to come and gather his sheep into his fold, and becomes the good Shepherd: and according to the blessings of Moses, Joseph is the firstling of his bullock. Let us read it: [Deut. 33:13-17] And of Joseph he said, Blessed of the Lord be his land, for the precious things of heaven, for the dew, and for the deep that coucheth beneath, and for the precious fruits brought forth by the sun, and for the precious things put forth by the moon, and for the chief things of the ancient mountains, and for the precious things of the lasting hills, and for the precious things of the earth and fullness thereof, and for the good will of him that dwelt in the bush: let the blessing come upon the head of Joseph, and upon the top of the head of him that was separated from his brethren. His glory is like the firstling of his bullock, and his horns are like the horns of unicorns: with them he shall push the people together from the ends of the earth: and they are the ten thousands of Ephraim, and they are the thousands of Manasseh. The beauty, the wisdom, and the extent of this blessing upon the seed of Joseph, have never yet been found out by the world, nor fully understood by all the saints.–In the first place, Moses says, Blessed of the Lord be his land, &c. And why?–Because it is the land on which the saints of the living God shall gather in the last days, to receive the Savior at his second coming. It is blessed of the Lord, too, for the precious things of heaven: the fullness of the gospel in the Book of Mormon: for instance, [2 Ne. 3:4-21] I am a descendant of Joseph, which was carried captive into Egypt–And great was the covenants of the Lord, which he made unto Joseph: wherefore, Joseph truly saw our day. And he obtained a promise of the Lord, that out of the fruit of his loins, the Lord God would raise up a righteous branch unto the house of Israel; not the Messiah, but a branch which was to be broken off; nevertheless, to be remembered in the covenants of the Lord, that the Messiah should be made manifest unto them in the latter days, in the spirit of power, unto the bringing of them out of darkness unto light; yea, out of hidden darkness and out of captivity unto freedom. For Joseph truly testified, saying: A seer shall the Lord my God raise up, which shall be a choice seer unto the fruit of my loins. Yea, Joseph truly said, thus saith the Lord unto me: A choice seer will I raise up out of the fruit of thy loins; and he shall be esteemed highly among the fruit of thy loins.–And unto him will I give commandment, that he shall do a work for the fruit of thy loins, his brethren, which shall be of great worth unto them, even to the bringing of them to the knowledge of the covenants which I have made with thy fathers. And I will give him a commandment, that he shall do none other work, save the work which I shall command him. And I will make him great in mine eyes: for he shall do my work. And he shall be great like unto Moses, whom I have said I would raise up unto you, to deliver my people, O house of Israel. And Moses will I raise up, to deliver thy people out of the land of Egypt. But a seer will I raise up out of the fruit of thy loins; and unto him will I give power to bring forth my word unto the seed of thy loins; and not to the bringing forth my word only, saith the Lord, but to the convincing them of my word, which shall have already gone forth among them. Wherefore, the fruit of my loins shall write; and the fruit of the loins of Judah shall write; and that which shall be written by the fruit of thy loins, and also that which shall be written by the fruit of the loins of Judah, shall grow together, unto the confounding of false doctrines, and laying down of contentions, and establishing peace among the fruit of thy loins, and bringing them to the knowledge of their fathers in the latter days; and also to the knowledge of my covenants, saith the Lord. And out of weakness he shall be made strong, in that day when my work shall commence among all my people, unto the restoring thee, O house of Israel, saith the Lord. And thus prophesied Joseph, saying:–Behold, that seer will the Lord bless; and they that seek to destroy him, shall be confounded: for this promise, of which I have obtained of the Lord, of the fruit of thy loins, shall be fulfilled. Behold I am sure of the fulfilling of this promise.–And his name shall be called after me; and it shall be after the name of his father. And he shall be like unto me; for the thing which the Lord shall bring forth by his hand, by the power of the Lord shall bring my people unto salvation; yea, thus prophesied Joseph. I am sure of this thing, even as I am sure of the promise of Moses; for the Lord hath said unto me, I will preserve thy seed forever. And the Lord hath said, I will raise up a Moses; and I will give power unto him in a rod; and I will give judgment unto him in writing. Yet I will not loose his tongue, that he shall speak much: for I will not make him mighty in speaking. But I will write unto him my law, by the finger of mine own hand; and I will make a spokesman for him. And the Lord said unto me also, I will raise up unto the fruit of thy loins; and I will make for him a spokesman. And I, behold, I will give unto him, that he shall write the writing of the fruit of thy loins, unto the fruit of thy loins; and the spokesman of thy loins shall declare it. And the words which he shall write, shall be the words which is expedient in my wisdom, should go forth unto the fruit of thy loins. And it shall be as if the fruit of thy loins had cried unto them from the dust: for I know their faith. And they shall cry from the dust; yea, even repentance unto their brethren, even that after many generations have gone by them.–And it shall come to pass that their cry shall go, even according to the simpleness of their words. Because of their faith, their words shall proceed forth out of my mouth unto their brethren, which are the fruit of thy loins; and the weakness of their words will I make strong in their faith, unto the remembering of my covenant which I made unto thy fathers. Thus spake Lehi to his son Joseph, and who is there that can not rejoice when he reads such a glorious and sacred promise? When we look abroad in the earth and view the extent of the Lord’s dominions in this world; when we reflect upon the space of time that the Lord has allowed the sons of men to set these dominations in order, by giving them the privilege of the gospel; and when we consider how much the Lord has promised to such as build up his kingdom on the earth, we are astonished! When Jacob, or as he was named, Israel, blessed the children of Joseph, he crossed his hands and put Ephraim the youngest first, saying his seed shall become a multitude of nations; and Lehi says, repeating the words of Joseph of Egypt, [2 Ne. 3:12] the fruit of my loins shall write; and the fruit of the loins of Judah shall write, &c. and the writings shall grow together. Let us now compare these great sayings with the prophecy of Ezekiel: [Ezek. 37:16-28] Moreover thou son of man, take thee one stick, and write upon it, For Judah, and for the children of Israel his companions: then take another stick, and write upon it, For Joseph, the stick of Ephraim, and for all the house of Israel his companions: And join them one to another into one stick; and they shall become one in thy hand. And when the children of thy people shall speak unto thee, saying, Wilt thou not shew us what thou meanest by these? Say unto them, Thus saith the Lord God; Behold I will take the stick of Joseph, which is in the hand of Ephraim, and the tribes of Israel his fellows, and will put them with him, even with the stick of Judah, and make them one stick, and they shall be one in my hand. And the sticks whereon thou writest shall be one in thy hand before their eyes. And say unto them, Thus saith the Lord God; Behold, I will take the children of Israel from among the heathen, whither they be gone, and will gather them on every side, and bring them into their own land: And I will make them one nation in the land upon the mountains of Israel; and one king shall be king to them all: and they shall be no more two nations, neither shall they be divided into two kingdoms any more at all: Neither shall they defile themselves any more with their idols, nor with their detestable things, nor with any of their transgressions: but I will save them out of all their dwelling places, wherein they have sinned, and will cleanse them: so shall they be my people, and I will be their God. And David my servant shall be King over them; and they all shall have one shepherd: they shall also walk in my judgment’s, and observe my statutes, and do them. And they shall dwell in the land that I have given unto Jacob my servant, wherein your fathers have dwelt, and they shall dwell therein, even they, and their children, and their children’s children forever: and my servant David shall be their prince forever. Moreover I will make a covenant of peace with them; it shall be an everlasting covenant with them: and I will place them, and multiply them, and will set my sanctuary in the midst of them for ever more. My tabernacle also shall be with them: yea, I will be their God, and they shall be my people. And the heathen shall know that I the Lord do sanctify Israel, when my sanctuary shall be in the midst of them for evermore. So, then, it appears, that Ephraim, besides becoming a multitude of nations, writes and keeps one of the sticks or books of the Lord. The stick of Judah, the bible, is about as much acknowledged and received as the Savior was, when he came to fulfil the words of the prophets, to be offered a sacrifice for sin. But there is another light, which presents itself to us, which ought not to be omitted. Say, our Savior came through the tribe of Judah, and the Jews kept the record or the bible, as it is called, for the scepter was not to depart from Judah, nor a lawgiver from between his met, until Shiloh come; and then, that the Redeemer, shall come the second time, to the tribe of Joseph; and they have also written and kept a record, called the book of Mormon, for, from thence is the Shepherd the Stone of Israel: who can mistake what Ezekiel meant by the Two Sticks? They are the Lord’s reading sticks [or records] for the benefit of Israel. The circumstance of Jacob’s serving seven years for Rachel, and his great disappointment when finding himself wedded to Leah, may with propriety be connected with the history of Joseph, as one of the great similes of the Lord to show great things to some, according to their faith, and nothing to others agreeable to the blindness of their minds. 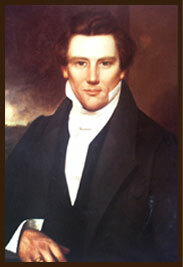 Passing, however, this with many other circumstances, which are connected with the well-being and final glory of Joseph, but, which can be sought out and read by the humble searcher for truth, with pleasure, in the bible and book of Mormon, we proceed to quote the word of the Lord, in relation to saving of the House of Joseph: for Joseph may now be considered as bearing the ensign of the Lord to the nations. As the Lord hath written unto Ephraim the great things of his law, and they are counted as a strange thing: so also, is the Lord preparing to show unto him the glory of the last days; [Deut. 33:17] for his horns are the horns of Unicorns, with them he shall push the people together from the ends of the earth. Now what a sublime figure this is! The sons of Joseph among the nations, to come forth as the servants of the Lord, in the last days and push the people to Zion; for at the same time, saith the Lord, will I be the God of all the families of Israel, and they shall be my people. [Jer. 31:2-21] Thus saith the Lord, The people which were left of the sword found grace in the wilderness; even Israel, when I went to cause him to rest. The Lord hath appeared of old unto me, saying, Yea, I have loved thee with an everlasting love: therefore with loving-kindness have I drawn thee. Again I will build thee, and thou shalt be built, O Virgin of Israel; thou shalt again be adorned with thy tabrets, and shalt go forth in the dances of them that make merry. Thou shalt yet plant vines upon the mountains of Samaria: the planters shall plant, and shall eat them as common things. For there shall be a day, that the watchmen upon the mount Ephraim shall cry, Arise ye, and let us go up to Zion unto the Lord our God.–For thus said the Lord; Sing with gladness for Jacob, and shout among the chief of the nations: publish ye, praise ye, and say, O Lord, save thy people, the remnant of Israel. Behold, I will bring them from the north country, and gather them from the coasts of the earth, and with them the blind and the lame, the woman with child and her that travaileth with child together: a great company shall return thither. They shall come with weeping, and with supplications will I lead them; I will cause them to walk by the rivers of waters in a strait way, wherein they shall not stumble: for I am a father to Israel, and Ephraim is my first born. Hear the word of the Lord, O ye nations, and declare it in the isles afar off, and say, He that scattered Israel will gather him, and keep him, as a shepherd doth his flock. For the Lord hath redeemed Jacob, and ransomed him from the hand of him that was stronger than he. Therefore they shall come and sing in the height of Zion, and shall flow together to the goodness of the Lord, for wheat, and for wine, and for oil, and for the young of the flock and of the herd: and their soul shall be as a watered garden; and they shall not sorrow any more at all. Then shall the virgin rejoice in the dance, both young men and old together: for I will turn their mourning into joy, and will comfort them, and make them rejoice from their sorrow. And I will satiate the soul of the priests with fatness, and my people shall be satisfied with my goodness, saith the Lord. Thus said the Lord; A voice was heard in Ramah, lamentation, and bitter weeping; Rachel weeping for her children refused to be comforted for her children, because they were not. Thus saith the Lord; Refrain thy voice from weeping, and thine eyes from tears: for thy work shall be rewarded, saith the Lord; and they shall come again from the land of the enemy. And there is hope in thine end, saith the Lord, that thy children shall come again to their own border. I have surely heard Ephraim bemoaning himself thus; Thou hast chastised me, and I was chastised, as a bullock unaccustomed to the yoke:–turn thou me, and I shall be turned; for thou art the Lord my God. Surely after that I was turned, I repented; and after that I was instructed, I smote on my thigh: I was ashamed, yea, even confounded, because I did bear the reproach of my youth. Is Ephraim my dear son? is he a pleasant child? for since I spake against him, I do earnestly remember him still: therefore my bowels are troubled for him; I will surely have mercy upon him saith the Lord. Now mark, Ephraim is the first born; the Lord’s dear son, and a pleasant child, and the Lord will have compassion upon him, notwithstanding it is said by the prophet Hosea, that they, (the seed of Ephraim) shall be wanderers among the nations; notwithstanding Ephraim is joined to idols; let him alone; notwithstanding Ephraim hath mixed himself among the people; notwithstanding Ephraim is a cake not turned; notwithstanding Ephraim is like a silly dove without a heart, and notwithstanding Ephraim is a heifer taught, and loves to tread out the grain, Ephraim shall ride, for the Lord hath spoken it. Half the tribe of Manasseh, being absent near the lost tribes in the region of Arsareth, we shall not pretend to say as much in relation to Mansseh as Ephriam. But to make all things plain let us remember, what the Lord has said in relation to Joseph as a house, or particular portion of Israel; that he would save it. The words of Zechariah are in point: [Zech. 10:6-12] I will save the house of Joseph, and I will bring them again and place them: for I have mercy upon them; and they shall be as though I had not cast them off: for I am the Lord their God, and will hear them. And they of Ephraim shall be like a mighty man and their heart shall rejoice as through wine; yea their children shall see it, and be glad; their heart shall rejoice in the Lord. I will hiss for them, and gather them; for I have redeemed them; and they shall increase as they have increased. And I will sow them among the peoples and they shall remember me in far countries; and they shall live with their children, and turn again. I will bring them again also out of the land of Egypt, and gather, them out of Assyria; and I will bring them into the land of Gilgad and Lebanon; and place shall not be found for them. And he shall pass through the sea with affliction, and shall smite the waves in the sea, and all the deeps of the river shall dry up: and the pride of Assyria shall be brought down, and the sceptre of Egypt shall depart away. And I will strengthen them in the Lord; and they shall walk up and down in his name, saith the Lord. How plain the Lord has told the world, that he would do great things for the house of Joseph, and well might the Psalmist exclaim: [Ps. 80:1-19] Give ear, O shepherd of Israel, thou that leadest Joseph like a flock; thou that dwellest between the cherubims, shine forth. Before Ephraim and Benjamin and Manasseh stir up thy strength, and come and save us. Turn us again, O God, and cause thy face to shine; and we shall be saved. O Lord God of hosts, how long wilt thou be angry against the prayer of thy people? Thou feedest them with the bread of tears; and givest them tears to drink in great measure. Thou makest us a strife unto our neighbors: and our enemies laugh among themselves. Turn us again, O God of hosts, and cause thy face to shine; and we shall be saved. Thou hast brought a vine out of Egypt, thou hast cast out the heathen and planted it. Thou preparedst room before it, and didst cause it to take deep root, and it filled the land. The hills were covered with the shadow of it, and the boughs thereof were like the goodly cedars. She sent out her boughs unto the sea, and her branches unto the river. Why hast thou then broken down her hedges, so that all they which pass by the way do pluck her? The boar out of the wood doth waste it, and the wild beast of the field doth devour it. Return, we beseech thee, O God of hosts: look down from heaven, and behold and visit this vine: And the vineyard which thy right hand hath planted, and the branch that thou madest strong for thyself. It is burnt with fire, it is cut down, they perish at the rebuke of thy countenance. Let thy hand be upon the man of thy right hand, upon the son of man whom thou madest strong for thyself. So will not we go back from thee: quicken us, and we will call upon thy name. Turn us again, O Lord God of hosts, cause thy face to shine; and we shall be saved. Here let us pause. The Lord is great and his words fail not. The shepherd of Israel, which comes leading Joseph like a flock, stir up thy strength before Ephraim, and Benjamin, and Manasseh. Ah what precious words! Judah is to be gathered at old Jerusalem; the lost tribes, with the half tribe of Manasseh, will be restored by Elijah, which leaves Ephraim, the remaining half tribe of Manasseh, and Benjamin to be stirred up by the good shepherd. What a consolation! No wonder Ephraim was likened unto a green fir tree, for says the Lord: [Hosea 14:8] From me is thy fruit found. When the Savior was on the Earth, he spake this parable: [Luke 18:2-13] There was in a city a judge, which feared not God, neither regarded man. And there was a widow in that city; and she came unto him, saying, Avenge me of mine adversary. And he would not for a while: but afterward he said within himself, Though I fear not God, nor regard man; yet, because this widow troubleth me, I will avenge her, lest by her continual coming she weary me. And the Lord said, Hear what the unjust judge saith. And shall not God avenge his own elect which cry day and night unto him, though he bear long with them? I tell you that he will avenge them speedily. Nevertheless, when the Son of man cometh, shall he find faith on the earth? And he spake this parable unto certain which trusted in themselves that they were righteous, and despised others: Two men went up into the temple to pray; the one a Pharisee, and the other a publican. The Pharisee stood and prayed thus with himself, God, I thank thee, that I am not as other men are, extortioners, unjust, adulterers or even as this publican. I fast twice in the week, I give tithes of all that I possess. And the publican, standing afar off, would not lift up so much as his eyes unto heaven, but smote upon his breast, saying, God be merciful to me a sinner. Now, beloved reader, when the Son of man comes shall he find faith on the earth? He will find some with Ephraim, if Hosea’s words are true, that–From me is thy fruit found. Again, taking this parable for a sample, will he come to those that pray in fine houses and fast by states and nations, as it were, giving bountifully of their wealth, to Bible societies, and temperance societies, while the poor, are forgotten by them, or will he come to them that humble themselves and cry mightily, Not our will but thine, O God be done? Joseph was a type of coming events unto his seed; Ephraim was to become a great many nations, and all these things were to be fulfilled in the last days.–The land of Joseph was to be blessed above all others, and Joseph was to be honored by his parents and brethren, according to his dream of the singing hosts of heaven. Joseph was sold into Egypt to save his father’s household from famine as a type of what should be afterwards. It is thus said in the Book of Mormon, by Moroni the chief captain of the Nephites, who lived about seventy years before the birth of the Savior: Behold, we are a remnant of the seed of Jacob; yea, we are a remnant of the seed of Joseph, whose coat was rent by his brethren, into many pieces; yea, and now behold, let us remember to keep the commandments of God, or our garments shall be rent by our brethren, and we be cast into prison, or be sold, or be slain; yea, let us preserve our liberty, as a remnant of Joseph; yea, let us remember the words of Jacob, before his death; for behold, he saw that a part of the remnant of the coat of Joseph was preserved, and had not decayed.–And he saith, [Alma 46:24] Even as this remnant of garment of my sons hath been preserved, so shall a remnant of the seed of my son be preserved by the hand of God, and be taken unto himself, while the remainder of the seed of Joseph shall perish, even as the remnant of his garment: And again: [Ether 13:4-8] Moroni the son of Mormon, who sealed and hid up this record, says in the book of Ether: Behold, Ether saw the days of Christ, and he spake concerning a New Jerusalem upon this land; and he spake also concerning the house of Israel, and the Jerusalem from whence Lehi should come; after it should be destroyed, it should be built up again a holy city unto the Lord; wherefore it could not be a New Jerusalem, for it had been in a time of old, but it should be built up again, and become a holy city of the Lord; and it should be built up unto the house of Israel; and that a New Jerusalem should be built up upon this land, unto the remnant of the seed of Joseph, for the which things there has been a type: for as Joseph brought his father down into the land of Egypt, even so he died there; wherefore the Lord brought a remnant of the seed of Joseph out of the land of Jerusalem, that he might be merciful unto the seed of Joseph, that they should perish not, even as he was merciful unto the father of Joseph, that he should perish not; wherefore the remnant of the house of Joseph shall be built upon this land; and it shall be a land of their inheritance; and they shall build up a holy city unto the Lord, like unto the Jerusalem of old; and they shall no more be confounded, until the end come, when the earth shall pass away. Now as Joseph caused all the Egyptians to leave the room when he made himself known to his brethren: So the branch of his seed, which was lead to this continent by the hand of the Lord, to prepare the land of their inheritance, and the other branches which are wandering among the nations, may be brought from the east, and gathered from the west, ready to meet the Redeemer when he brings again Zion. In the view of this coming scene is a joy, which can not be known by them that are without the hope of a glorious resurrection. Before Joseph went into Egypt the great day of a thousand years’ holiness on earth, was better known among some men than now. What started a party of high-mined men to build a Tower to go to heaven? The world had just been immersed with water: Zion had previously been taken to paradise, and for fear that it might again be destroyed, as they had again begun to trust in themselves, this evil generation, sat out to force themselves into heaven, without coming in as the Lord had appointed. Now, it is well known that Abraham, Isaac, and Jacob, were so much in favor with the Lord, that he talked with them and gave them commandments, and they were filled with the Holy Ghost, and knew many things in relation to the last days, which they taught, to their posterity. Although Joseph, or Ephraim, may be mixed among the nations, so that feet have scarce trod where he hath not been, & good and evil have not come to the lot of any on earth, more than him, still as the blessing to him was the greatest, and as he was lord over all Egypt, so shall he become a multitude of nations, reaching from sea to sea, and from the river to the ends of the earth, among the rest of the saints. [Micah 4:2-13] For it shall come to pass, that many nations shall come, and say, Come, let us go up to the mountain of the Lord, and to the house of the God of Jacob; and he will teach us his ways, and we will walk in his paths: for the law shall go forth of Zion, and the word of the Lord from Jerusalem. And he shall judge among many people, and rebuke strong nations afar off; and they shall beat their swords into ploughshares, and their spears into pruninghooks: nation shall not lift up a sword against nation, neither shall they learn war any more. But they shall sit every man under his vine and fig-tree; and none shall make them afraid: for the mouth of the Lord of hosts hath spoken it. For all people will walk every one in the name of his god, and we will walk in the name of the Lord our God for ever and ever. In that day, saith the Lord, will I assemble her that halteth, and I will gather her that was driven out, and her that I have afflicted; And I will make her that halted a remnant, and her that was cast far off a strong nation: and the Lord shall reign over them in mount Zion from henceforth, even for ever. And thou, O tower of the flock, the strong hold of the daughter of Zion, unto thee shall it come, even the first dominion; the kingdom shall come to the daughter of Jerusalem. Now why doest thou cry out aloud? is there no king in thee? is thy counsellor perished? for pangs have taken thee as a woman in travail. Be in pain, and labor to bring forth, O daughter of Zion, like a woman in travail; for now shalt thou go forth out of the city, and thou shalt dwell in the field, and thou shalt go even to Babylon; there shalt thou be delivered; there the Lord shall redeem thee from the hand of thine enemies. Now also many nations are gathered against thee, that say, Let her be defiled, and let our eye look upon Zion. But they know not the thoughts of the Lord, neither understand they his counsel: for he shall gather them as the sheaves into the floor. Arise and thresh, O daughter of Zion: for I will make thy horn iron, and I will make thy hoofs brass: and thou shalt beat in pieces many people: and I will consecrate their gain unto the Lord, and their substance unto the Lord of the whole earth. To close: what can be said more than the Lord hath said? Judah would not receive the Savior at his first coming, and he was crucified. He then manifested himself to the other tribes and remnants. The word was, whosoever shall fall on this stone shall be broken: but on whomsoever it shall fall, it will grind him to powder. The Jews fall upon that stone and were broken: and, O ye inhabitants of the earth, beware! for if that stone falls upon you, it will grind you to powder. Remember that Joseph’s glory, is the firstling of his bullock, & also, that with his horns, he is to push the people together from the ends of the earth. God made the world in six days, and rested on the seventh, and blessed and sanctified it: and thus will he do with creation, for the creation of the spiritual world was in the likeness of the temporal; the temporal a preparation for man to enter into the Sacred Rest: The Lord has now begun to feed the flock of his heritage with the rod, [or word of truth] as in days of old, and according to the days of his coming out of the land of Egypt, will he show marvelous things. The oceans have to roll back into one place; the valleys have to be exalted; the mountains have to flow down at his presence, the sun has to be darkened, and the moon turned into blood, and stars have to fall, then behold, he will come to reign on the earth with power and great glory, and all the holy angels with him; yea, with the church of the first born, even Zion which was received up to the bosom of the Father, in the days of Enoch, before the flood; that the righteous that died in the hope of a glorious resurrection, may arise and meet the Lord in the air, and live again, in the flesh, on the earth. A TREASTISE ON THE HOUSE OF JOSEPH AND THE LAND PROMISED TO HIS POSTERITY–THE PLACE OF THE MOUNT ZION OF GOD IN THE LAST DAYS. In the 15th, 19th and 20th Nos. of “Zion’s Reveille” we have treated at length on the “temporal covenant” God made with Abraham, concerning the land of Canaan. We now call the attention of our readers to the land promised to the “branches” (posterity) of Joseph, one of the twelve sons of Jacob. Those that are familiar with the history of Joseph, as given in the scriptures, know that the brothers sold him into Egypt, because of envy that arose in their hearts against Joseph in consequence of a dream that he had concerning some sheaves, in which the sheaves of his brethren bowed to his sheaf. The interpretation of the dream indicated to Joseph’s brethren that they should yet become dependent or subservient to their brother Joseph. And as human nature always stood opposed to the divine purposes of God, dictated by the voice of revelation, so Joseph’s brethren could not endure the thought that God should make their younger brother in any matter superior to them; so they readily devised a scheme in which they vainly thought to thwart the plans of the Great God. There arose a famine in the land of Canaan, in which Jacob was compelled to send his elder sons, together with his younger one, (Benjamin,) down into Egypt to buy corn. This gave occasion for Jacob and his sons to go down into Egypt, and there became subject to the political government of the dynasty of the Pharaoh’s. Fourteen years before the death of Jacob he had the pleasure of once more seeing his beloved son Joseph, whom he thought, by the report of his other sons, had been slain by the wild beasts. For what we have stated above, read Gen. xxxvii. to the xlvii. inclusive. Gen. xlviii, 1, “And it came to pass after these things, that one told Joseph, Behold thy father is sick: and he took with him his two sons, Manasseh and Ephraim. 4. And said unto me, Behold, I will make thee fruitful, and multiply thee, and I will make of thee a multitude of people; and will give this land to thy seed after thee, for an everlasting possession. 5. And now, thy two sons, Ephraim and Manasseh which were born unto thee in the land of Egypt, before I came unto thee into Egypt, are mine: as Reuben and Simeon, they shall be mine. 6. And they issue, which thou begettest after them, shall be thine, and shall be called after the name of their brethren in their inheritance. 8. And Israel beheld Joseph’s sons, and said, Who are these? 9. And Joseph said unto his father, They are my sons, whom God hath given me in this place, (Egypt.) And he said, Bring them, I pray thee, unto me, and I will bless them. 10. Now the eyes of Israel were dim for age, so that he could not see. And he brought them near unto him; and kissed them, and embraced them. 11. And Israel said unto Joseph, I had not thought to see thy face: and lo, God hath shewed me also thy seed. 13. And Joseph took them both, Ephraim in his right hand toward Israel’s left hand, and Manasseh in his left hand, toward Israel’s right hand, and brought them near unto him. 14. And Israel stretched out his right hand, and laid it upon Ephraim’s head who was the younger, and his left hand upon Manasseh’s head, guiding his hands wittingly; for Manasseh was the first-born. 16. The angel which redeemed me from all evil, bless the lads; and let my name be named on them, and the name of my fathers Abraham and Isaac: and let them grow into a multitude in the midst of the earth. 17. And when Joseph saw that his father laid his right hand upon the head of Ephraim, it displeased him: and he held up his father’s hand, to remove it from Ephraim’s head unto Manasseh’s head. 18. And Joseph said unto his father, Not so, my father: for this is the first-born; put thy right hand upon his head. 19. And his father refused, and said, I know it, my son, I know it; he (Manasseh) also shall become a people, and he also shall be great; but truly his younger brother shall be greater than he, and his (Ephraim’s) seed shall become a multitude of nations. 21. And Israel said unto Joseph, Behold, I die; but God shall be with you, and bring you again unto the land of your fathers. Now comes the all-absorbing question relative to one of the grand items of the peculiar faith of the Church of Jesus Christ of Latter Day Saints. Wake up ye sectarian divines, of this the nineteenth century, and answer it, or by your silence show your ignorance. On this point we will acknowledge we stand or fall as a church. If our answer to our own question is true we stand forever, if not we fall to rise no more. The question is this,–Where did the posterity of EPHRAIM “become a multitude of nations?” Answer it we pray you. Not on the land of Canaan, surely, for of the seed of Jacob there never was but two nations, viz. : Judah and Israel, on that land. The following scriptures are connected with the several sayings of Jacob on all of his twelve sons. We pass over all except the blessing on the head of his son Joseph. Gen. xlix. 1, “And Jacob called unto his sons, and said, Gather yourselves together, that I may tell you that which shall befall you in the last days. If the reader will review the blessing of Jacob on his son Joseph impartially, he will readily see that those peculiar sayings could not possibly apply to Joseph or his posterity on the eastern continent; neither is there a people now known on the face of the whole earth unto whom those sayings will apply, except those to whom we have applied them. But when we turn our attention to the American Indians, we find that every letter is brought to bear in full, without the loss of one word. There was nothing peculiar in the land of the inheritances of Joseph, Manasseh or Ephraim on the land of Canaan that render it in any degree distinct in point of character from that of the rest of Canaan, neither did Ephraim there become a multitude of nations, neither could he. Neither was he there in any sense whatever any more “separate from his brethren” than any other tribe was separate one from the other. But when we consider the peculiar saying of Moses on the head of Joseph concerning his land in connection with that of Jacob, (as inserted above,) then turn our attention to America, and on this continent we find a land bearing all the peculiar characteristics spoken of by Moses concerning the land of Joseph; which sayings we cannot apply to any other land but America. 2 That sendeth ambassadors by the sea, even in vessels of bulrushes (rushing vessels) upon the waters, saying, Go, ye swift messengers, to a nation scattered and peeled, to a people terrible from their beginning hitherto; a nation meted out and trodden down, whose land the rivers have spoiled! Considering the locality of the prophet as being at Jerusalem, in Canaan, (Ethiopia anciently included all Africa,) we must look “beyond” the “rivers” of Africa for the “land shadowing with wings,” or spreading forth like wings. Please look on your map and notice North and South America, with their conjunction at the Isthmus of Darien, and there is nothing in nature that affords a better figure to represent the form of the American continent than the spread “wings” of a fowl. From Palestine, looking through the Mediterranean beyond the rivers of Africa, we behold America, and a people, the American Indians, “scattered and peeled” and “trodden under foot.” The third verse calls the attention of the whole “world” to the dispensation of the restoration of all Israel, first the Ephraimites to “Mount Zion,” on the land of Joseph, and then the “house of Judah” in the four corners of the earth, and the house of Israel in the “north country,” to the land of Canaan. For further evidence that the “city,” or the “Mount Zion,” of God should be built in the land of America, read Psalm xlviii. “On the sides of the north”–this expression will not apply to the ancient Mount Zion at Jerusalem, because that was on the south of Jerusalem; therefore it must refer to the side of the earth, and as we have the equator as the only line from which we can reckon sides of the earth, we can only infer that Mount Zion should be north of the equator instead of south; then, as a matter of course, if Zion is to be in America it must be in North America. The term prairie is a French term, and signifies meadows. I ask, are not the prairies of North America literally “fields of the wood?” and are they not meadows? 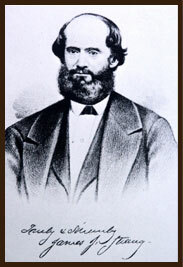 Isaiah lix. 20, “And the Redeemer shall come to Zion, and unto them that turn from transgression in Jacob, saith the LORD. lx. 1, “Arise, shine; for thy light is come, and the glory of the Lord is risen upon thee. xlix. 1, “Listen, O isles, unto me; and hearken, ye people, from far; The LORD hath called me from the womb; from the bowels of my mother hath he made mention of my name. Zech. x. 6, “And I will strengthen the house of Judah, and I will save the house of Joseph, and I will bring them again to place them: for I have mercy upon them; and they shall be as though I had not cast them off: for I am the Lord their God, and will hear them. 7. And they of Ephraim shall be like a mighty man, and their hearts shall rejoice as through wine: yea their children shall see it, and be glad; their hearts shall rejoice in the Lord. Obad. 17, “But upon mount Zion shall be deliverance, and there shall be holiness; and the house of Jacob shall possess their possessions.